The major enterprises of farmers is dairy enterprise with cross breeding cows. In the district, crossbred population is 5.80 lakh with average milk yield of 10 to 12 lit/day cow. Traditional housing in dairy farming causing repeat breeding, mastitis out break and infestation of various diseases causing high cost on medicine . Similarly dairy farming becoming more labor intensive due to which farmers are diverting from this important enterprise. While considering all the problems, concept of loose housing has been introduced by the KVK. 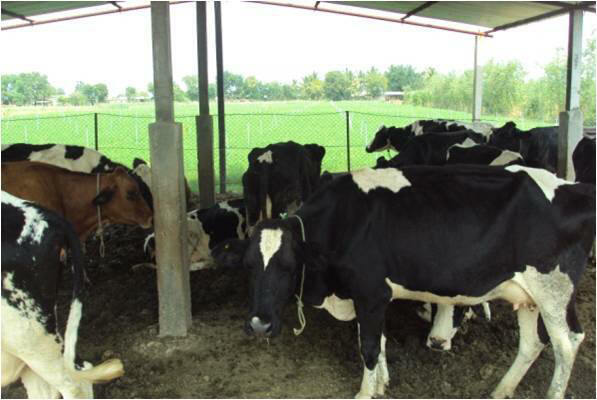 For promoting loose housing system in dairy, technology like improved feeding system, varieties of fodder crops, watering system, milking machine, mat system, teat dip cup ,grooming, chaff cutter, low cost shed made up of bamboo, chain link fencing are the interventions in the conventional system. Technological and skill imparting training organized at KVK. . In the training period exposure visit were arrange at MPKV,Rahuri and other places to see the loose housing system. In technology week model of loose housing system was shown besides organization of seminar on loose housing system in which more than 300 farmer and farm women participated. Loose housing concept is important to reduce the work in the dairy shed including changing the places, removing dung, cleaning and washing animals. Similarly it improves the milk production besides reduction in diseases and health problems. Animal have to be able to drink water any time when they need within their housing area. Loose housing provides comfort and exercise which affect on increasing in additional milk of 300-350 lit per year per cow. Now there are more than 350 loose housing farms in which more than 3000 cows are being reared by farmer and they are saving on labor. One labor is sufficient for rearing 10 to 15 cows and saving of Rs 500 per cow on treatment and additional saving of two labor cost of Rs.48000 per year. Loose housing system improves hygiene conditions of animal which resulted in minimizing repeat breeding, tick infestation and mastitis. Now many farmers are attracted to this system due to implementation of loose housing concept on mission mode by KVK.